Tim Hudak is no longer the mystery man. The question is, now that his Ontario Progressive Conservative (PC) platform is out there, will it matter? 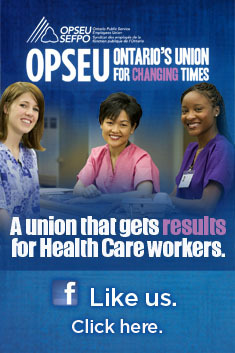 Hudak has made it clear that he intends to make public sector workers a target, including workers in health care. The platform goes on to suggest support services “like food preparation or laundry” in our “public institutions” are a prime example where he expects these competitions to take place. “We will require arbitrators to respect the ability of taxpayers to pay and take into account local circumstances,” the document states. Specific to health care, Changebook makes the same promise as the McGuinty Liberals when it comes to funding – reduce increases to three per cent per year. Hudak promises a review of all agencies and commissions, but would axe the LHINs before that even takes place. He would not replace the LHINs, which raises questions about how health care planning, local funding, and community engagement will take place. He says he will redirect the $70 million per year from closing the LHINs into front line care. At present Ontario spends $47 billion on public health care. The Tories say they will add 5,000 new long term care beds and increase investments in home care to “give families more control over services.” That includes the ability to stay with the provider they have now, or pick a new government-funded home care provider who better meets their individual needs. Given the Tories have supported competitive bidding in home care, it is unclear whether an individual will be able to maintain their provider after they have lost the CCAC contract. While the Tories promise to increase investments in home care, they also promise to find savings at the CCACs. Hudak says he will clamp down on fraud, but the only specific promise is to demand that people using the old red and white health cards also present another form of government-issued identification, such as a driver’s license or passport. Unlike the Federal NDP, which promised more doctors and nurses, the Tories only claim to add to the number of doctors by increasing residency placements for medical students from Ontario who have pursued their education outside Canada. They call upon doctors, nurses, nurse practitioners, and physician assistants to work collaboratively, particularly in underserviced areas. There is no mention of the other health professions integral to the public health system. Like the McGuinty Liberals, the Tories vow to be as obsessive about measuring health outcomes and “introducing a rigorous system of patient satisfaction.” Do we read that as even more patient satisfaction forms to fill out? And how does this square with the promise to reduce bureaucracy? The Tories say they will make it law that the province cannot raise taxes without a clear mandate. Unfortunately, it is silent on needing the same to cut taxes, particularly for corporations. They also promise to expand the scope of Freedom of Information, but it is not clear how. “Hudak’s election platform is the kind of document that made Greece the model of fiscal prudence it is today,” writes Gray. Niagara Health System (NHS) will get a fresh look at its controversial Hospital Improvement Plan (HIP) that closed down two ERs in Fort Erie and Port Colborne. The Minister of Health has ordered what is called a “third party” review although members of the NHS board will be part of that review along with representatives of the municipalities and the Local Health Integration Network. The review will only look at phases of the hospital improvement plan that have already been implemented. It will not look at phases that have yet to be implemented, including changes to pediatrics and birthing. The review is certainly welcome, although two of the three parties engaged in the review were responsible for the initial HIP that has upset residents of the Niagara Region. While deficits at NHS have been again climbing, Matthews insists the original HIP moved the hospital in the right direction. Further terms of the review have yet to be determined and will be left up to the LHIN. On the eve of an election, the news opens the door a crack after years of active lobbying by the local community, including Sue Hotte and the Yellow Shirt Brigade. The HIP was ordered by the LHIN in May 2008 and was conducted largely by executives from the Ottawa Hospital, including Dr. Jack Kitts. The report was submitted in October 2008 and approved by the LHIN in January 2009. There are three issues that really coloured OPSEU’s initial relationship with the LHIN – both of them taking place long before the LHINs were even a concept in former Health Minister George Smitherman’s brain. One is competitive bidding in home care, where contracts come and go, and so do the workers. The second is the dramatic difference between what workers earn in the hospital and how they are remunerated in the community. The third is the betrayal of mental health. Significant cuts to psychiatric hospitals were made and the promised alternate services were only partially re-established in the community. In 2005 when we first learned of the LHINs, it sounded like more of the same. When people are afraid, they fight the change. Long before the LHINs there was something called Hospitals In Common Labs. It is a non-profit corporation run by Ontario hospitals that does lab work for 250 health care provider clients from across Canada. HICL has generated $100 million in revenue over the last decade that has gone back into its participating hospitals. It is considered to be the gold standard for medical lab testing. It is therefore astonishing when the South East LHIN tells the media they had to make hospitals in their region play nice in the sandbox. Sorry SE LHIN, your hospitals were light years ahead of you. HICL has been around since 1967. With a focus on transitioning work, often overlooked is the idea of keeping the work in place but cooperating as a system, as HICL has done. To be fair, many of the integrations we are now seeing are more along these lines. At the Central East LHIN a proposal was looked at that would merge the two cardiac rehab programs in Durham with the goal of expanding the program and filling in gaps. The program – which involves weekly sessions with those at risk for heart disease, stroke and diabetes – can only be successful if they are delivered within a 30-minute radius of the patient. Expanding the program would be a huge benefit to the region. Not only does it improve the chances of survival for a high-risk group, but it also improves quality of life, including a measureable reduction in anxiety and depression. This week the Central East LHIN also spent time on a strategy that would bring together service providers to improve specialized geriatric services. That strategy includes a CEO-level committee to plan an entire system of care for frail seniors. By involving the CEOs, it ensures greater buy-in within the organizations. The proposal for an umbrella organization for frail seniors is timely – growth in the seniors population is expected to grow 19 per cent by 2019, at which time 47 per cent will be over the age of 85. There is desperate need for a more coherent approach to these services. When Dr. Alex Hukowich left the board of the Central East LHIN, he made it clear that he was unsure whether the parts the LHIN was taking out of the system or putting into the system were of value. Maybe that’s part of the problem – the need to pluck pieces out and put pieces back in is probably limited. Getting the various pieces to work as a system is likely the greater challenge. To deal with that, the Ministry and the LHINs have to overcome a lot of history, including addressing some of our longstanding grievances prior to when the LHIN was even here.